We can not have a holiday gift guide without chocolate. You know me. It is essential for gifts, parties and stockings! We spent our first Halloween here in Colorado and I was excited when we parked right in front of Justin’s headquarters the night of trick-0r-treating. 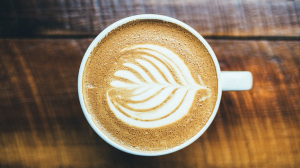 I LOVE sharing local-to-me-companies, especially yummy ones! Yes you can not get better than organic peanut butter with organic fair-trade chocolate. Right? You can just TASTE the difference on how much creamier and full of flavor these are then those other cups we know. Seriously, you can. Santa’s bag should be loaded with these. Milk Chocolate, Dark Chocolate, or White Chocolate? Which one do you want to try first? When I opened my Chuao box about 2 minutes after it landed on my doorstep, I started giggling. I was tickled and awed by my choices! I immediately posted on Instagram and asked – which one do I eat first? It was seriously hard! In fact there is a chocolate bar there called Pop corn pop bar – with a surprising POP it says on the wrapper. It DID pop in my mouth!! This picture is of my son grabbing a piece of the Oh my s’mores bar when I was getting ready to snap a pic. Real marshmellows are hard to resist! The one with nuts is Ravishing rocky road and third is Pretzel toffee twirl bar. Do you see why I’m going a little crazy? They are unique and delicious! 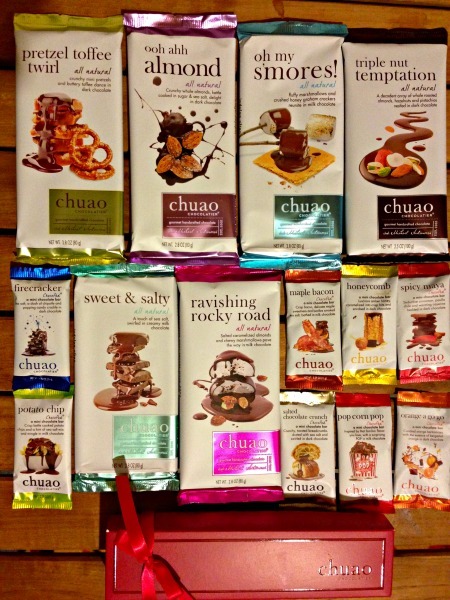 WIN a variety pack from Chuao Chocolatier and Justin’s! I received these products for review and all opinions are my own. This giveaway will end on November 28, 2014 at midnight EST. Winners will be drawn via rafflecopter. Once a winner is drawn I will contact them and they will have 48 hours to reply before I draw a new winner. Giveaway is open to anyone in US and you must be 18 years of age or older. Giveaway not affiliated with Facebook & I release them of liability. Winner will be posted in the rafflecopter widget. The Bible Series official companion Book Giveaway! Definitely need chocolate!...Not just for the holidays but all year long! :) Thank you for the chance! absolutely MUST have chocolate at the holidays - and any day! I love the flavor variety with Chuao! I love that Justin's dark chocolate peanut butter cups are VEGAN! They are delicious too! I need chocolate all year round! I'm a huge fan of Justin's Nut Butter but have yet to try Chuao Chocolate but it looks awesome! What a well timed post. My youngest son was just sharing his new found love of PB cups. "What's that amazing smell? ... CHOCOLATE!!" Totally relatable to my life quote from Frozen. I love having Chocolate at the Holidays! It is fun and trying these chocolates out would be awesome. Thanks for an awesome giveaway. Yes! I love chocolate and I love Justins peanut butter cups! Sooo good! YES! I must have chocolate at the holidays!! But I have to be honest and tell you that I also really love chocolate throughout the year, too. I LOVE chocolate!! Thank you. Yum! I would love to try these! Chocolate is a big part of my holidays. I really like the milk chocolate Justins peanut butter cups. The Chuao looks AMAZING. Pinning this for later. Oh yes we must! I am going crazy about these Chuao chocolates. Whoever doesn't? Could not be a friend of mine. Yes, I would love to win this. These look delicious. Of course, you need chocolate at the holidays!! Chocolate is a big part of our holiday! Thank you! We all love chocolate here! Thanks for the giveaway. i just tried these for the first time last night!! they are delicious. I love chocolate , esp good quality dark chocolate. yum! Love chocolates! Looks like a great one to try! The holidays are one of the best times to eat chocolate. This would be great to give my grandkids! Now that they say chocolate is good for us i feel like I can eat more than ever now, I love chocolate. Chocolate is a must have! Chocolate is great for holidays and every day in between. i love justin's nut butters but haven't tried the chocolate cups yet!! i hope i win! Everyone loves chocolate on Christmas in my family. I love chocolate all the time especially at the holidays makes a great gift too. I must have chocolate all the time.....lol. We all need some chocolate during the holidays. We definitely need chocolate for the holiday-every holiday! Chocolate is a must in my house, the sweeter the better! I love the dark chocolate Justin's nut butter cups. Thanks for hosting this, would be great for the holidays. We always have lots of chocolate in our stockings! I've gotta have chocolate around all the time but especially at Christmas!!! I've seen the chuao chocolate bars in stores, but never tried them. The unique flavors look so fun! DEFINITELY must have chocolate lol..I've always wanted to try Justin's! Thank you for the chance to win! Joey J. Definitely! Chocolate is a must at Christmas!!! 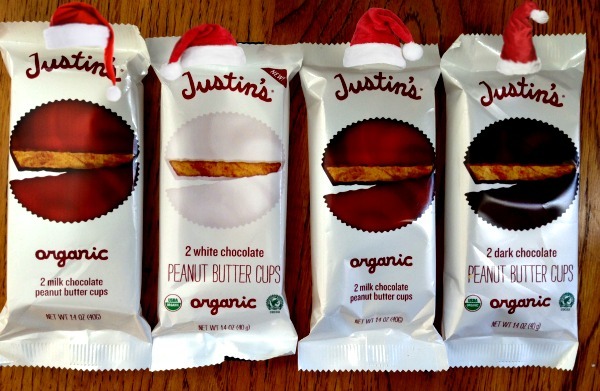 The Justin's are perfect for stocking stuffers! Yum! I'd have to put some of these in my stocking too! Chocolate is a necessity all year round for us women. Those white chocolate peanut butter cups are calling my name! I must have chocolate everyday!! My sweet tooth could use chocolate all year round, but it's a must have during the holidays! Absolutely! I love all the chocolaty goodness of the holidays. Always lots of candy Christmas at my parent's house!! Well, it wouldn't be Christmas for me without chocolate! yes, I must have chocolate at the holiday! But I do love chocolate all year round, too!! Thank you for this giveaway. Once in a while my son brings home a Justin's dark chocolate Peanut Butter cup from Startbucks (he works there), and I enjoy it so much!! It[s not the holidays without lots and lots of chocolate! Hot chocolate, brownies and more. YES we must have candy at Christmas, I'm known for having plenty of candy, cookies and nuts at my place. Justin's is a favorite around our house. Great giveaway! Of course we must have chocolate! These look divine! Of course! Who doesn't love Chocolate! You are correct you have to have chocolate for the holidays, we always have some around. Yes ma'am! Chocolate is a must during the holidays. These all look delicious and perfect for stockings and sharing with guests! I have tried Justin's peanut butter cups and they are delicious. We absolutely must have chocolate at the holidays, it wouldn't be the holidays without chocolate. Chocolate is so good, fingers crossed. I must have chocolate!! dessert isn't worth it unless there is chocolate in it! These would make great stocking stuffers for my daughter and hubby; they are both chocoholics. I like chocolate at the holidays and any of the other days, too. I have not tried the chocolate before but they sound great! Wow, I sure do love chocolate. So does my husband; I have to hide it from them. I would love to try these! I'm a clean eating gal so these seem like they would satisfy my chocolate cravings! Found the chocolate coins to go in my girls' stockings at Trader Joe's this past weekend. Tucked away for Christmas eve. they have so many yummy looking flavors! i love chocolate with stuff in it! Do yourselves a favor, try Justin's Peanut Butter Cups, amazing. These look SO good! Bring on the chocolate!! Everyone needs chocolate, holidays or not! I absolutely love chocolate but mainly dark chocolate. I go nuts without it. Oh yes! Otherwise it would't be festive without gorging on chocolate. My family LOVES chocolate. We have not tried Justin's before, but it sure looks good. I love organic/GMO free options, and this would become a family favorite I am sure. Deff. have chocolate at holiday events. I love chocolate! Although I haven't for a few years, I love to get myself my own box of chocolates for Christmas. These organic chocolates all look decicious! Peanut Butter Cups would probably be my favorite. We need chocolate in our life all the time. Thanks for the review and giveaway! My family would love this. Chocolate is a must have in my house. Yes, chocolate is a delicious part of the holidays ...and every day! Yes...most definitely!! I love chocolate! Thank you for the giveaway!! Chocolate is a MUST at holidays!! I can take or leave most chocolate treats except for peanut butter cups. So addicted! This prize looks amazing! Sorry, don't hate me but I can give or take chocolate....I know, odd for a female! 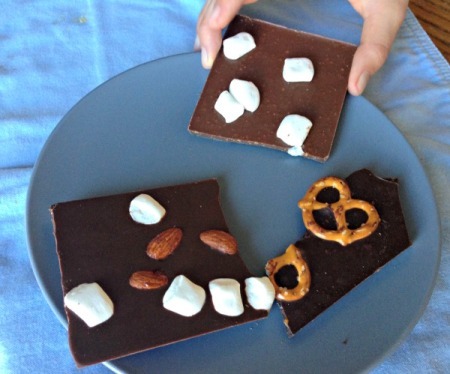 I love chocolate and the ravishing rocky road bar looks yummy! We always have Justin's in the house! Chocolate is a must in my household at all times. Thanks for the chance. We love Justin's and would love a chance to try Chuao Chocolatier. I've tried Justin's almond butter and really liked it, I look forward to trying those white chocolate peanut butter cups and those Chuao bars look really good too. TOTALLY - Chocolate is how I get through the holiday's ! There must ALWAYS be chocolate!! All the women on my paternal side have a serious love of chocolate, and this giveaway would enable me to be a rockstar when we gather, LOL. I love Justin's Peanut Butter cups and would love to try the Chuao Chocolates. ALWAYS !!!!!!!! ALL YEAR LONG.. I have chocolate almost every day! I love chocolate desserts at the Christmas holiday after all the pumpkin and lemon at Thanksgiving. Yes, we must have chocolate at the holidays. I love chocolate, especially during the holidays! have never heard of these bars and love the mixture. Chocolate makes the perfect stocking stuffer for my little ones! Thanks for the chance to win! I must have chocolate for the holidays!! I love chocolate, especially the really good stuff. I would love to try these products - they look so yummy!